For those who want to search for a renewable electricity provider and want to skip the Q&A, Green-e provides a search tool to find Third Party Electricity Providers that source electricity from renewable sources. To use their search tool: Go to Green-e Certified: Find Certified Products and Companies and search for Residential Renewable Energy in New Jersey. Why should I care about my electricity provider? According to the EPA, 32% (2012 data) of U.S. greenhouse gas emissions are produced from burning fossil fuels to generate electricity . In New Jersey, 23% (2009 data) of greenhouse gas emissions produced by the state are produced from electricity generation . Generating electricity from a renewable source instead of fossil fuels can significantly reduce U.S. greenhouse gas emissions and their impact on climate change. Since it may not be feasible to generate your own renewable electricity, switching to a Third Party Electricity Supplier (TPES) provides a way to support the generation of renewable electricity. What are Third Party Electricity Suppliers? In 1999, legislation was passed to allow consumers to shop for their energy provider opening up the market to providers other than traditional utility companies. Today, consumers like you have several electricity providers to choose from, and many of them claim to provide cheap or green electricity. 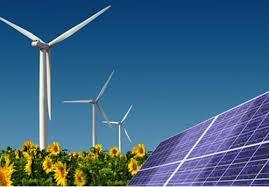 What is Renewable Electricity? What is Green Power? Renewable electricity is electricity generated from a source that is not depleted when used, such as wind or solar power. Some renewable electricity technologies, such as large-scale hydroelectric, can have environmental trade-offs associated with them. Green Power, while often used synonymously with renewable electricity, is defined by the EPA Green Power Partnership program as a subset renewable energy that represents only those renewable energy resources and technologies that provide the highest environmental benefit, including solar and wind. A number of TPES claim to provide Green Power. To understand how the electricity provider is providing Green Power, you must first understand the options that exist. A REC is simply a certificate that represents the environmental benefits that were accrued when some renewable electricity was generated somewhere. How much “do” RECs actually help the development of renewable electricity is currently a matter of debate. Furthermore, RECs are traded in a relatively non-transparent marketplace, making it difficult for an end-consumer to know the true cost of the RECs. What should I take into account when deciding on a TPES that claims to provide renewable electricity? The age and location of a green energy project are considered two of the most important criteria in determining how much the project promotes the growth of renewable electricity. A TPES that sources electricity from local green energy projects that have been built within the last 15 years are considered ideal. Green-e is a non-profit organization that provides a tool to search for TPES available to New Jersey residents and organizations. Their tool can help you identify a TPES that sells electricity from local renewable energy projects as well as those that offer a Green Power Program. When in doubt, one should examine the Environmental Disclosure Statement (EDS), which is required for all TPES and lists the fuel used to generate the electricity you are buying. Do I have to pay more for renewable electricity? Renewable electricity may be more or less expensive than electricity drawn from conventional sources, such as coal. Prices for electricity, both from conventional and renewable sources, do fluctuate, so when prices for conventional electricity are high, renewable electricity may be cheaper. To determine if the TPES rate for renewable energy is cheaper than the conventional supply from your utility, locate the Price to Compare (PTC) on your electricity bill. If the TPES price per kWh is less than your listed PTC, you could save money by choosing the TPES supplier. What kinds of plans are available? TPES offer various plans. Some plans offer a fixed price for electricity per kilowatt-hour for a specified amount of time that can range from 1 to 12 months. TPES may also offer variable rate plans where the price of electricity per kilowatt-hour can change from month to month. Variable rate plans allow consumers to benefit from falling market prices, but they also have increased risk for higher rates if electricity prices spike due to natural disasters, cold winters, or adverse market conditions. Some may also include an early cancellation penalty. Before deciding on a plan, be sure that you understand how the cost of your electricity may change and read through the TPES agreement or contract carefully. Is Your Home EnergySmart Yet? Princeton Homeowners know a lot more about their home energy usage these days! Thanks to the EnergySmart Homes Campaign, eighty of your neighbors and friends have had home energy assessments to date. If you haven't already signed up, we can help you get started on improving the energy efficiency, comfort and safety of your home. To schedule an EnergySmart Homes assessment at the discounted $49 rate, you can call our partner, Ciel Power LLC at 201-632-3463 or sign up via the Ciel Power website. For more information, read on below, and be sure to come to our EnergySmart Homes panel at the Princeton Public Library on Tuesday, June 10 at 7:00 p.m. to hear real life stories of Princeton residents who have conducted energy audits and made the recommended energy upgrades to their homes. Stay tuned for details about this event on our events listing. A home energy assessment, or audit, identifies where your home is wasting energy, what systems are working inefficiently and proposes cost effective solutions. It also identifies how you can maximize rebates and financial incentives from NJ's Home Performance with Energy Star program to help you offset the cost of those solutions, and identifies potential health hazards such as carbon monoxide levels, moisture (think mold), and air quality. Who does the assessment and what does it cost? A home energy assessment or audit is performed by an accredited and certified contractor. These contractors meet the certification and accreditation guidelines of the Building Performance Institute (BPI), the industry's resource for building science technology that sets standards for assessing and improving the energy performance of homes. Home energy assessments can cost $150-400 however, Sustainable Princeton has partnered with Ciel Power LLC, a Building Performance Institute (BPI) certified provider, to provide residential energy assessments at a discounted price of $49. Is my home a good candidate for a home energy audit? Older construction homes usually have the most to benefit from the improvements recommended in a home energy assessment. The audit takes about 2-4 hours depending on the size of your home. You should also plan for an hour follow up meeting approximately a week after the assessment with the contractor to go over the results. You will receive a report listing recommended measures, along with financial incentives available to pay for the work. What areas of my home will they be checking? The technician will inspect your home from top to bottom. They will need access to the main living areas of your home, attic, basement, your heating and cooling system and the outside perimeter of the house. Check out our Home Energy Resources page - lots of useful links, and a fun video clip, too! Come to our June 10th EnergySmart Homes panel at Princeton Public Library, 7:00 p.m.
Say hello at our other events, or contact us via email or phone. Princeton Shops Sustainably BYOBags for Sale! (June 2012 update: BYOBags now on sale at $5 each!) Sustainable Princeton’s BYOBag Campaign is selling a newly-designed reusable bag to help remind people to “Shop Local, Shop Fair Trade, and BYOBag.” The bag sale is also intended as a fundraiser for Sustainable Princeton and is cosponsored by the Princeton Merchants Association/Hometown Princeton and Fair Trade Princeton. The bags fold into a small pouch for easy carrying – perfect to take with you or great to give as gifts to family members, coworkers, teachers and others on your shopping list! Thank you to all of these vendors for helping us raise money and awareness about sustainable shopping! We also thank Church & Dwight for providing the initial funding to support the bag sale, and Maria Bahlmann, a local graphic designer and typographer, for her wonderful design! For more ideas on sustainable local shopping, please see our recent post “Turning Black Friday into Green Friday”. We also recommend a recent post by Michele Byers, Executive Director of the NJ Conservation Foundation about why we should all BYOBag this holiday season. 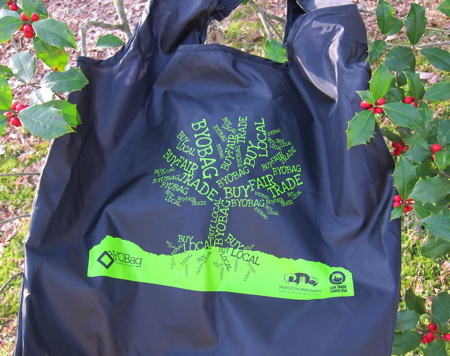 And don’t forget to check the BYOBag Campaign page on this website regularly for updates!